Despite Jamie Dimon’s record as a leader in the radical deregulation of banking, Obama continues to cozy up to his Wall Street backer. That Barack Obama is such a kidder. No matter how awkward the moment, he’s got just the right quip to purchase some wiggle room. Remember when his old Chicago banking buddy Jamie Dimon, the CEO of JPMorgan Chase, first ran into that bit of trouble over his bank’s “London Whale” derivative scam? That scheme has already lost $6 billion with close to another $1 billion piled on by the SEC in fines last week after JPMorgan admitted it broke the law. Yes, and counting; that $2 billion is now likely to end up around $16 billion given the future legal fees and possible payouts allotted to countering the myriad lawsuits connected with this admission of illegal activity. That’s aside from the mortgage fraud, Libor rate rigging and energy manipulation cases still confronting the beleaguered bank. 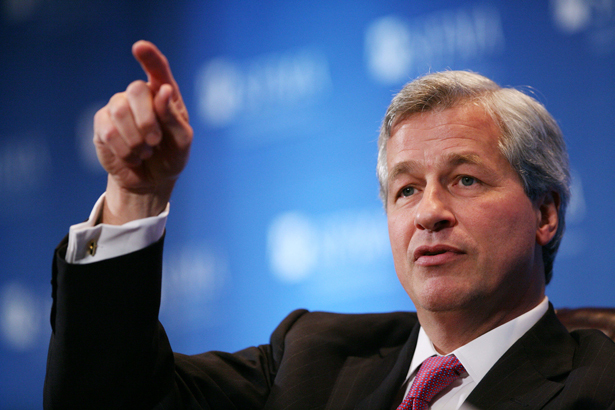 Thursday, on the same day that Dimon’s bank got slapped with the SEC fine, federal regulators revealed that JPMorgan had agreed to pay $389 million in penalties and refunds to compensate for a credit card identity theft protection scam after $309 million already paid out in that case. It should be remembered that this same Dimon, who appeared before a Senate committee wearing presidential cufflinks, once worked with Sanford Weill in engineering the reversal of the Glass-Steagall law to make Citigroup, a previously illegal merger of investment and commercial banks, possible. But despite his record as a leader in the radical deregulation of banking that caused all of the trouble, Obama turned to Dimon for direction on fixing the economy. If you still require to be disabused of Obama’s pretend populism, consider his decision to select William M. Daley, JPMorgan’s representative in Washington, to be his White House chief of staff. It gave Dimon the key White House connection to accompany the passkey he already had at Treasury with his pal Timothy Geithner as secretary. It was a real cozy arrangement; Dimon was still a governor of the New York Federal Reserve Bank, where he had served during Geithner’s presidency overseeing the banking meltdown. Geithner had been instrumental in arranging Fed financing for JPMorgan’s acquisition of troubled Bear Stearns through a $55 billion loan and later an additional $25 billion in TARP funds. Once appointed Treasury secretary, Geithner made himself very accessible to Dimon. As an Associated Press investigation reported, Dimon had numerous personal meetings and phone calls with Geithner while the White House was calibrating its response to the Wall Street crisis. Why are we not surprised that Obama has done nothing to break up the too-big-to-fail banks, the biggest now being Dimon’s? Don’t be fooled by the occasional fines; the banks have used the interest-free money to grow ever larger and more unaccountable in their behavior. After the SEC condemnation of JPMorgan’s “egregious breakdowns in controls” and conclusion that “senior management broke a cardinal rule of corporate management” to honestly inform the board of directors, top senior manager Dimon made all the right noises. JPMorgan announced that $4 billion and a staff of 5,000 employees would be devoted to compliance with the law. This was just the sort of commitment Dimon made in 2006 when he hired Stephen M. Cutler, who had been head of the SEC Division of Enforcement, to be JPMorgan’s general counsel. Once a committed regulator who urged corporations “to create a culture of compliance,” Cutler clearly drank the Kool-Aid at JPMorgan, for he was in charge of legal and compliance activities worldwide at the time of the London Whale fiasco. So much for trusting corporate compliance. Exactly the reason that too-big-to-fail banks can’t be trusted to do the right thing and why Obama shouldn’t have been guided by Dimon in the first place. At least Larry Summers will not be running the Fed.